Delphy’s CAS Texture and Unitool, which can be found here. with all relevent instructions on what you need to get it up and running. 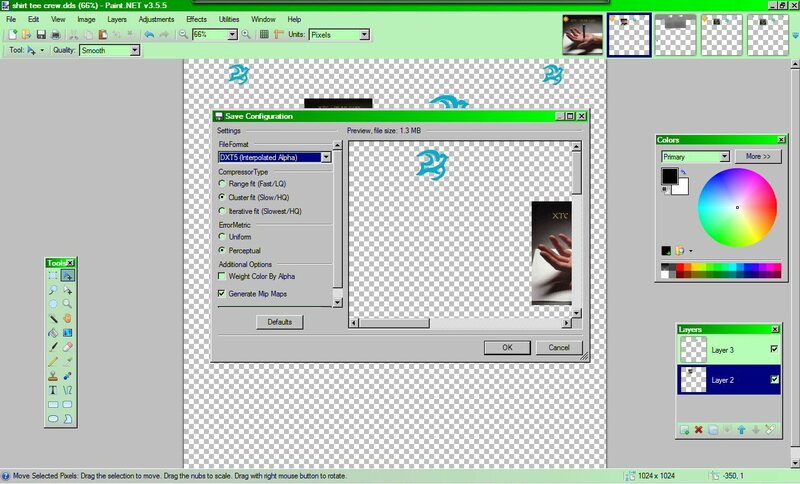 Paint.NET (which you can get here) – or whatever other graphics/photo manipulation package you prefer. 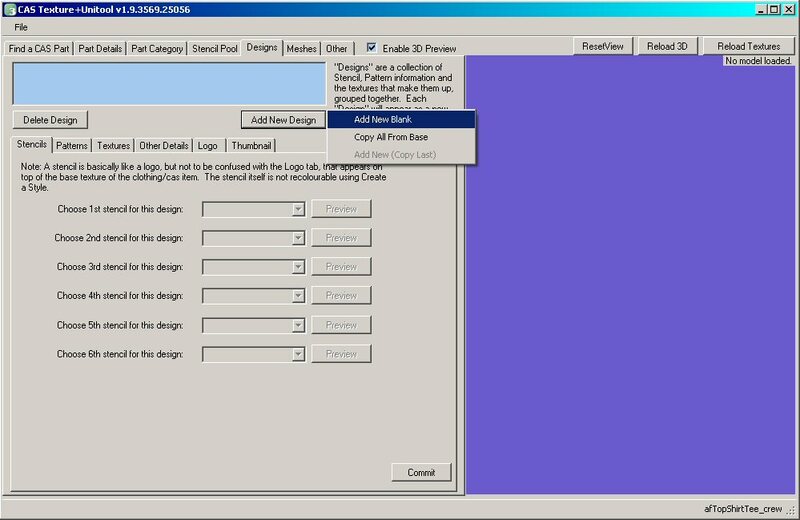 But the DDS plug-in that you will be saving your stencils in is already built into this program, and it costs you nothing to download, so until you feel confident with what you’re doing, use this! Patience – or at least a lack of latent psychosis. In order to speed things up for you the learner, we’ve got a bundle of templates for you to download and unzip here. Then first of all load up Paint.NET. 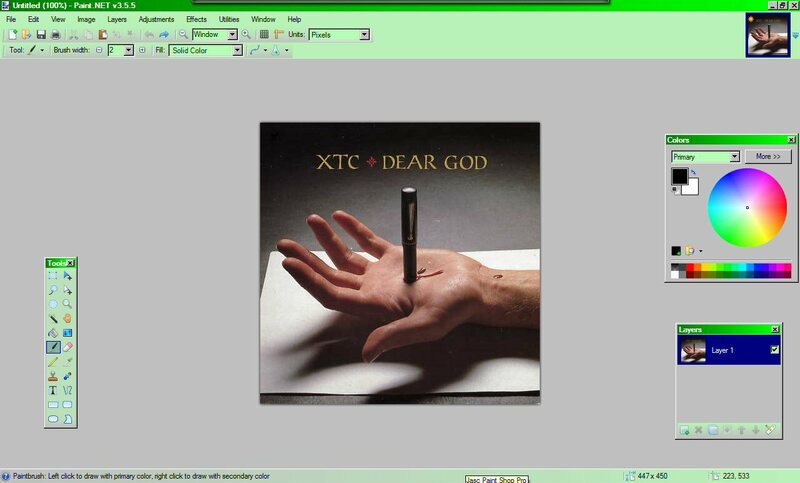 For the following example we’re going to use the picture sleeve for the XTC single ‘Dear God’, a cheerful little ditty of undiluted venom that got them into All Sorts Of Bother Big Time back in the 1980s. First thing we wish to do is reduce it to a size to fit the templates. 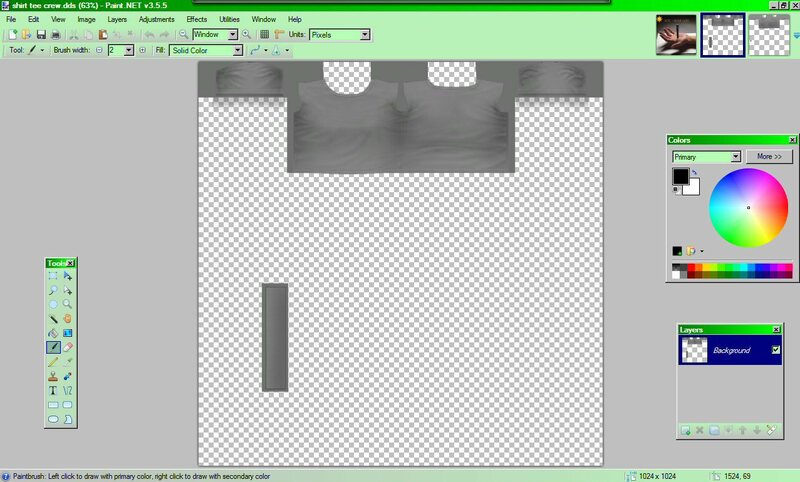 The rule of thumb is that once you make the width longer than the collar, the whole thing begins to distort, but we’ve found you can usually get away with a width of 165 pixels. 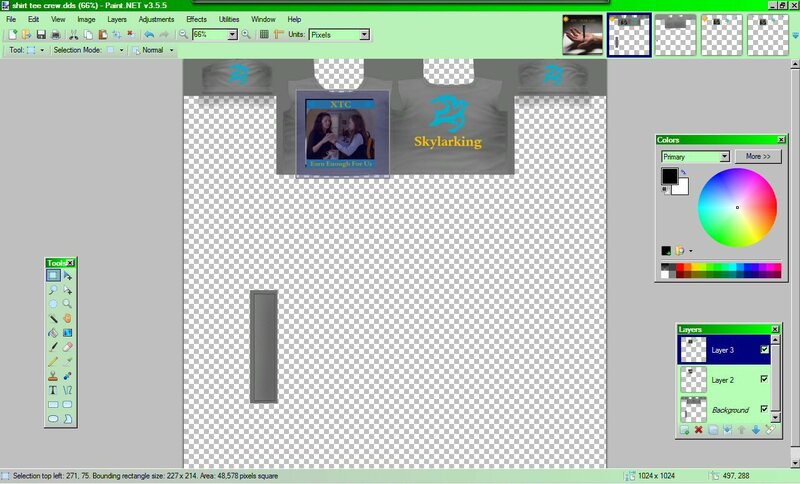 Now you want to open up the templates for the t-shirts – remember you need to make one female and one male, as it’s the same size for teen, young adult and adult. 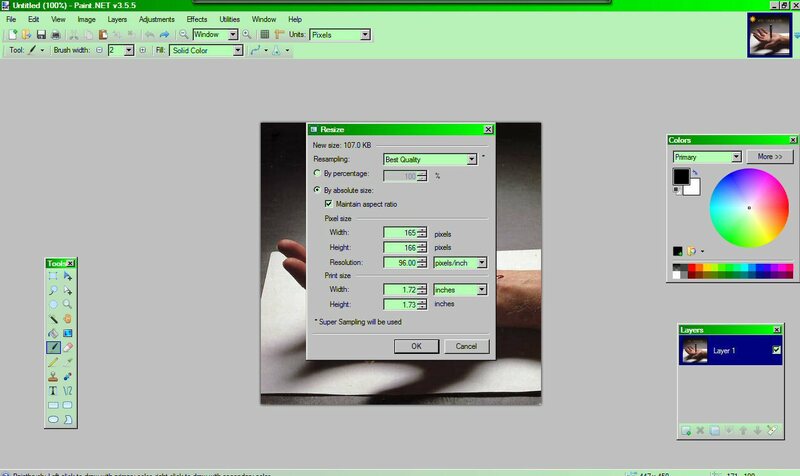 Now you want to paste it in as a Layer – if you’ve never used layers before, think of it like a piece of clear glass going over the entire picture with your picture on it. Now all that’s required is to position your picture. 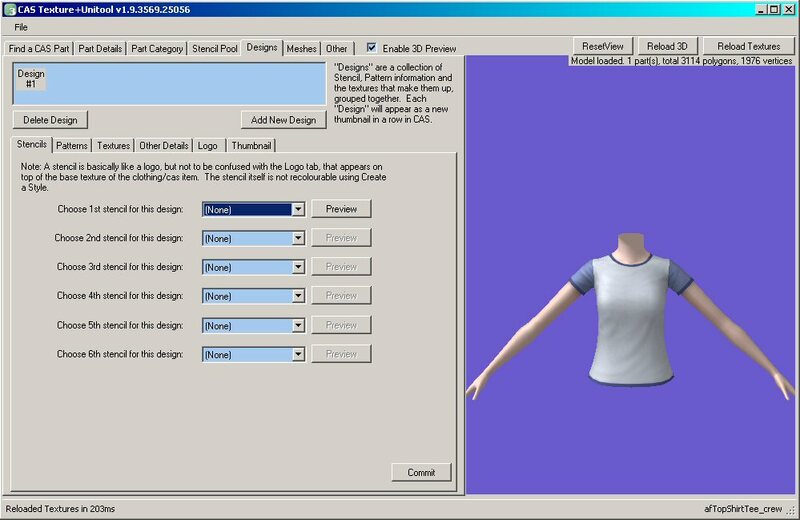 With female teen/adult, you have to bear in mind the extra ‘stretch’ on the bust line when positioning, which can make for some designs looking a bit weird when you get to wear the final article! Trial and error is the only way to find which ones you can get away with. All that’s left now is to put in whatever other bits of picture you want in the finished stencil, as in the above. If you are putting items on the sleeves, get into the habit of using the co-ordinates to ensure they line up on the same y-axis (the right hand number!) as one another, and favour putting the pictures close to the end of the sleeve for a better result. You can get away with sleeve pictures of a size of 65 by 65 pixels, but again don’t be afraid to experiment and see what you can get away with. ***Wee Cheeky Trick*** If you want to be really sneaky and use some details from a previous stencil again, simply load up the stencil, select all, copy it, then paste it in as another new layer – then erase out the bits you don’t need. 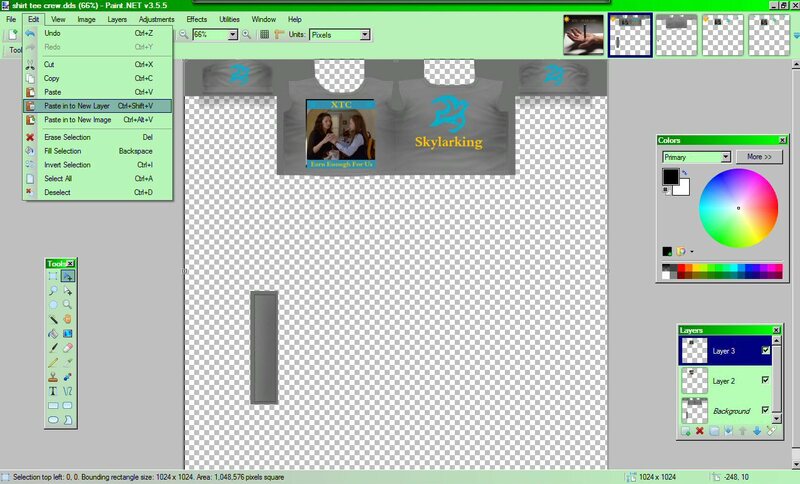 For example: we want to make similar T-shirts for other singles from the Skylarking album – like ‘Dear God’. So we load up the stencil we made earlier for ‘Earn Enough For Us’. We copy it, reselect the ‘Dear God’ stencil we were working on and paste in the ‘Earn Enough For Us’ one in a new layer (appearing here as Layer 3). Yes, the sharper-eyed amongst you will have noticed we’d moved the ‘Dear God’ picture in Layer 2 a little bit so you could see that the ‘Earn Enough For Us’ one was on top of it – done for illustrative purposes! 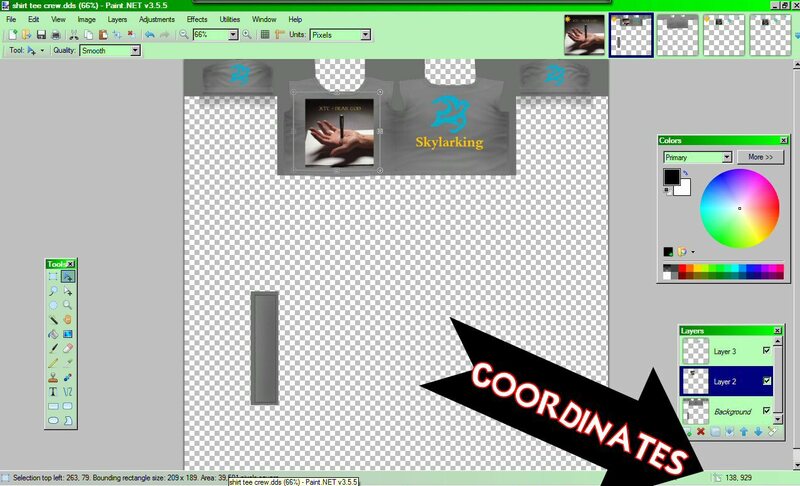 Now all we need to do is get rid of the front part, which you can do by either using the eraser tool – or if you want to be a lazy bum-nugget, use the selection tool, then press DELETE. 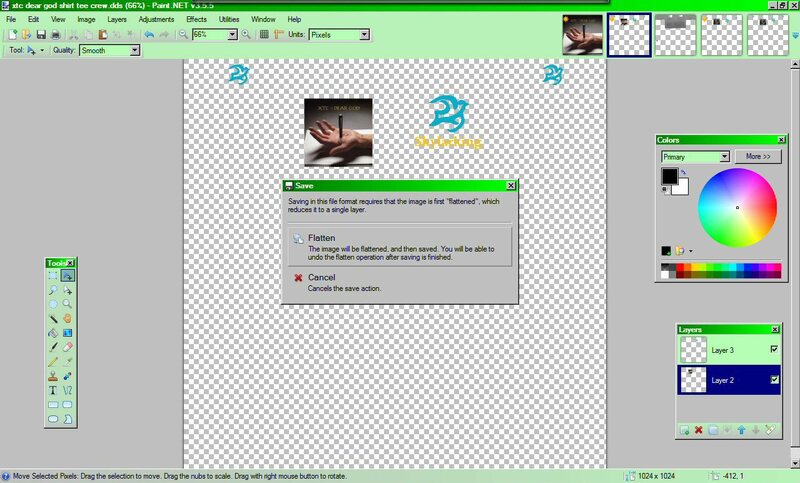 As you can see, only the parts of the layer you were working on (Layer 3) have been erased – the ‘Dear God’ picture down on Layer 2 is untouched. 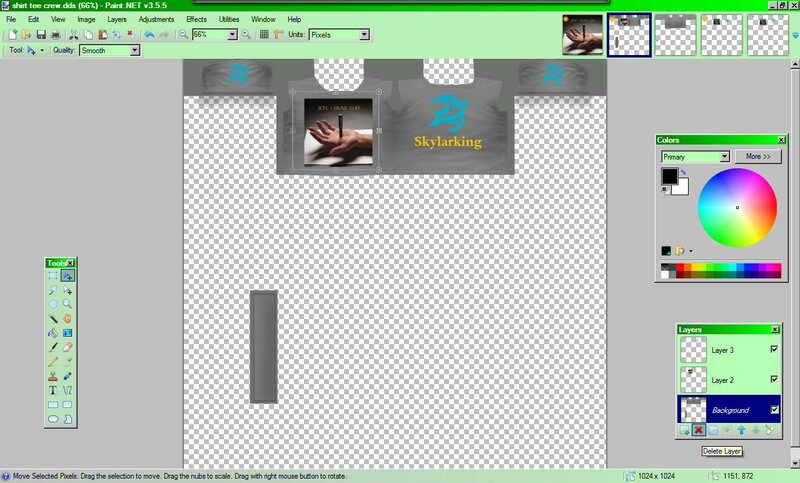 The active layer is always highlighted in the little Layers box. 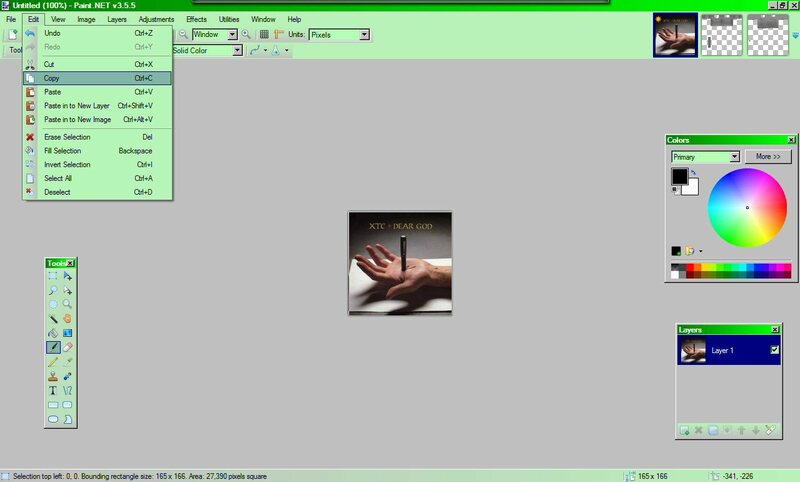 (If the Layers box vanishes, you can make it reappear by pressing F7 or going to the top menu bar, going to Window and selecting Layers). 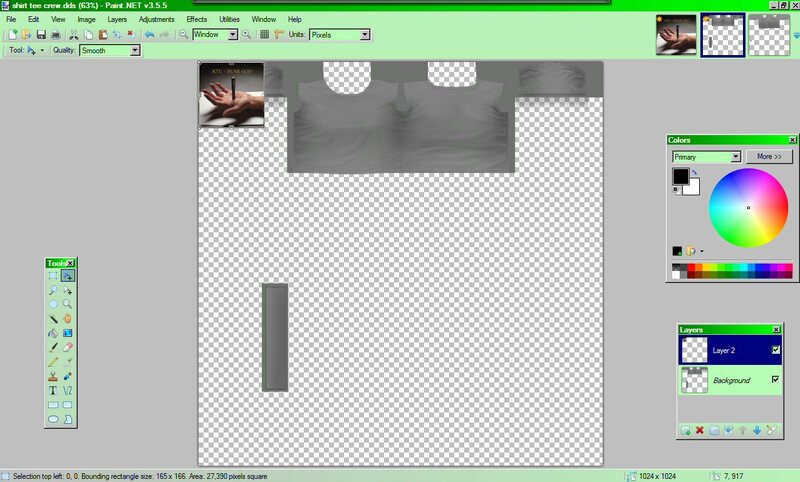 Now you are almost ready to save your masterpiece, but first you need to get rid of that grey t-shirt template you used to line up the various parts of the stencil you were making. 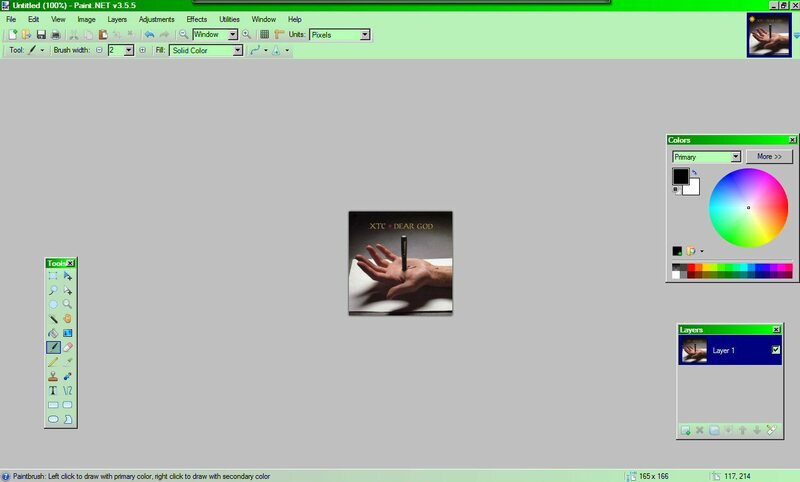 All you have to do is go to the Layers window, click on the Background layer to make it active, and then press the red X to delete it. 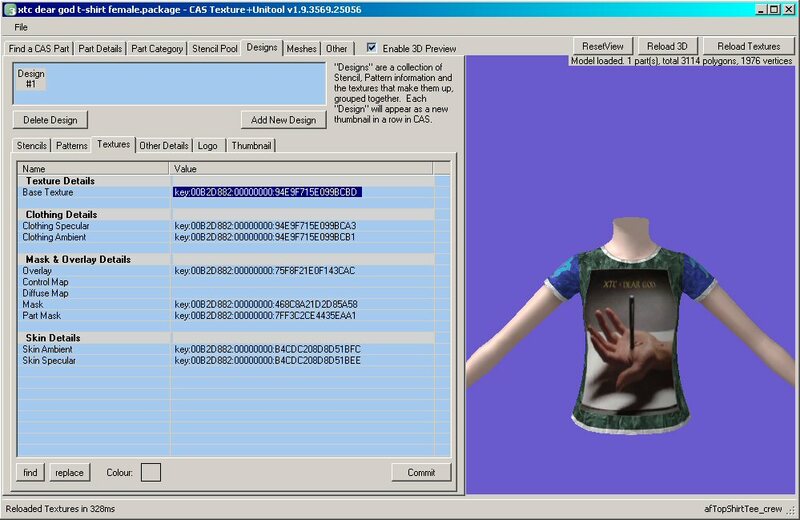 Your stencil is now ready to be saved and used in the CAS Texture Unitool – remember to save it as a DDS file in order that it will read it. Get into the habit of saving your stencils into a set file of their own for ease of tracking later, and with a naming system that’s easy for you to follow. Every time you save, you will be asked to check the configuration. Use the settings in the picture above and you will be fine. If you haven’t ‘flattened’ the stencil into a single layer yourself, then the system will ask you if you wish to do this. Press the Flatten option, and feel smug as the first part in the creation of your pending masterpiece is saved. Now for the good news – you’ve just done the hard bit. Honest! ***WARNING! *** Only read the following if you are prepared to accept that you will thereafter go completely power mad wasting hours of your life making custom clothing for every design you have ever wanted. Now click on the Designs tab at the top, then the Add New Design button, which will give you two options – click on Add New Blank. 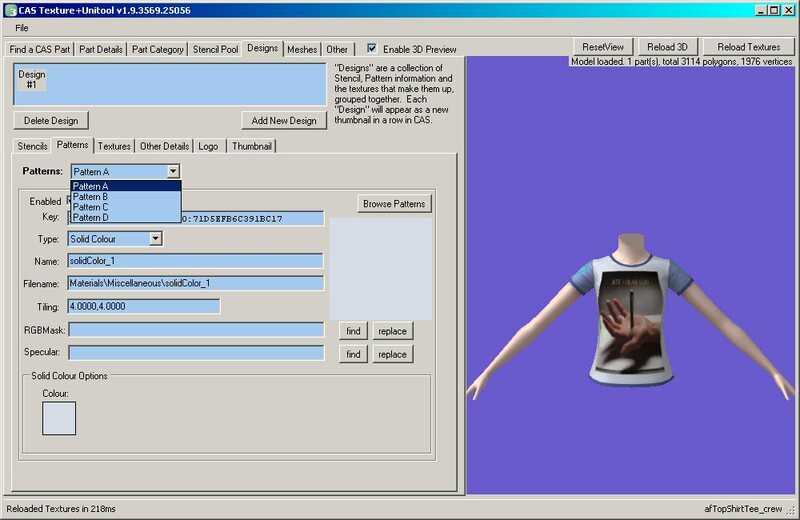 The t-shirt you are going to be working on will appear on the 3D screen. 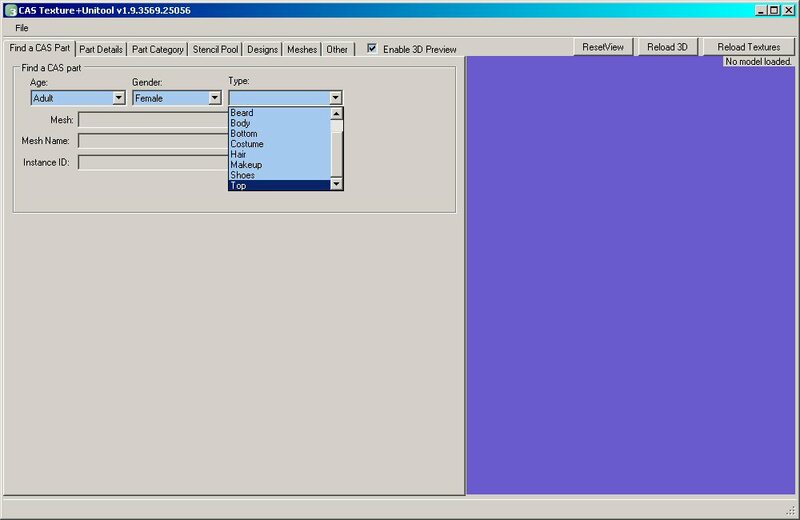 You now need to go to the Stencil Pool tab, click on the value for the Texture of Stencil 1 so that it is highlighted, and then go down and click on the Replace button. Time now to open up and load up that ‘Dear God’ female t-shirt stencil we made earlier! Once you have done this, you must press the Commit button at the bottom of this tab. If you fail to press Commit when you are making any changes to a particular tab page, then the change of stencil to the one you want will not happen. 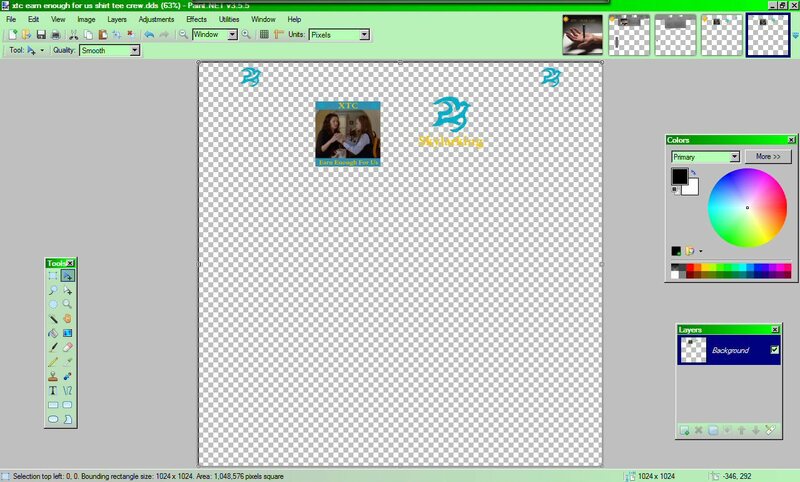 Now go to the Design tab (just to the right of the Stencil Pool one), and by default the Stencils folder will be first up – the very one you want! You’ve probably sussed already what happens next, but we’ll say it anyway! Choose Stencil 1 from the drop down box, then hit that Commit button at the bottom. Now click on the Pattern tab in order to change the colour of the T-shirt. 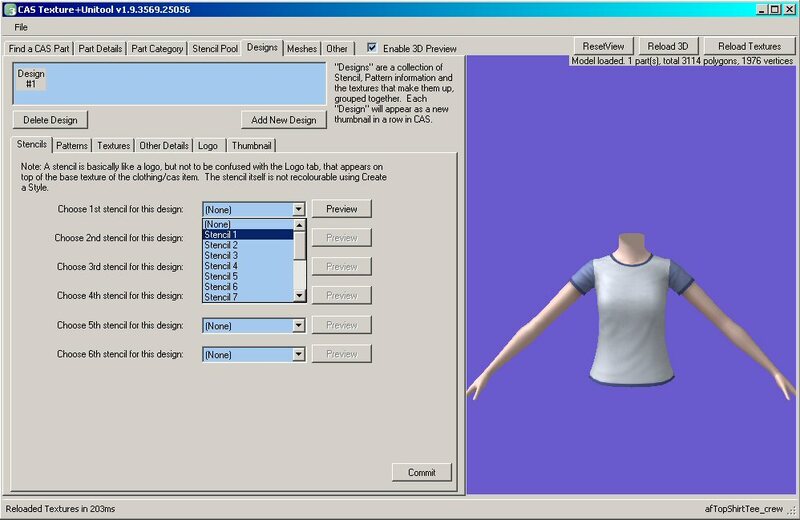 Pattern A is the main body of the the female teen/adult T-shirt, Pattern B is the sleeves, Pattern C is the collar and cuffs – you can ignore D in this case. 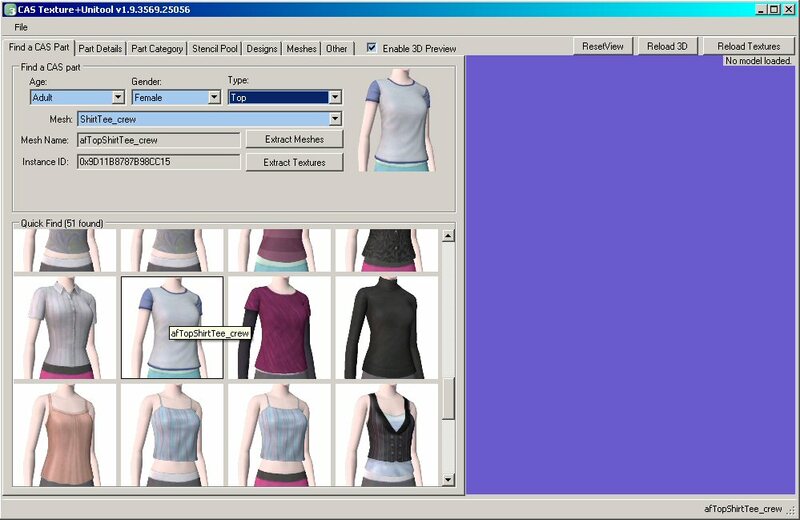 The number of adjustable Patterns varies per item of clothing – eg. male T-shirts only give you one for the whole shirt. Once you’ve finished playing around with the colour scheme to your heart’s content (the bit that will eat up most of your time doing this probably! 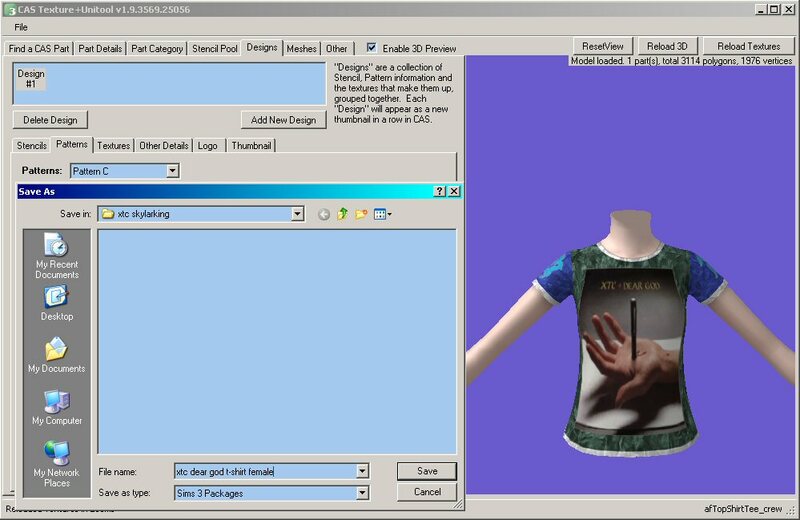 ), all that’s left to do is save your creation before moving a copy of it into your mods/package folder in your Sims 3 game. What About Clothes Other Than T-Shirts? 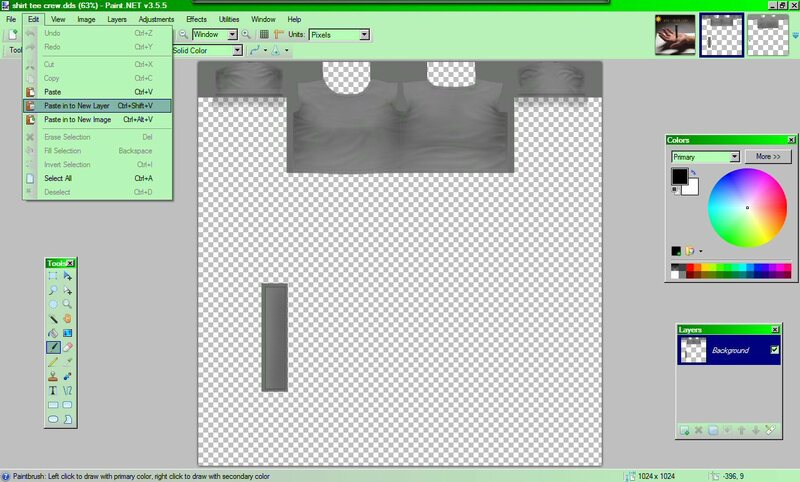 The same principle as outlined above for creating T-shirts applies to making hoodies, denim jackets, denims, whatever you want. You’re starting to feel power mad already, aren’t you? Whatever else you do, practice, practice, practice, until you can do it automatically. 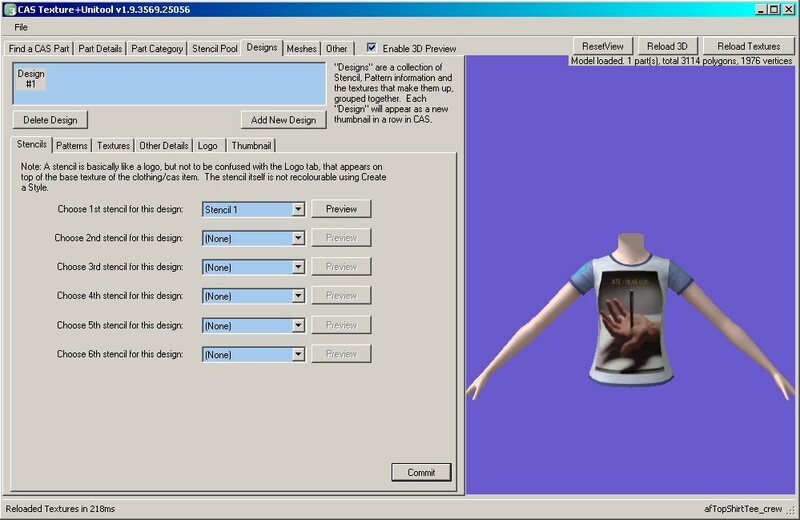 If you ever want to make templates for items other than those we’ve included in our download, what you’re looking for is the Textures tab just along from the Stencils one. 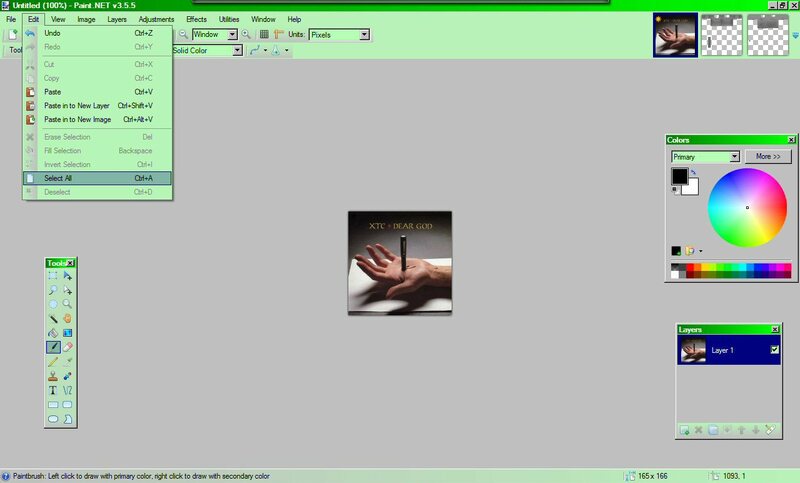 That grey lump surrounded with black is what you saw earlier on in the PaintNET part of this tutorial, except the black was transparent. Click on Export at the bottom right, and save it with an appropriate name to a set folder for all your templates. We hope this covers everything – and our apologies for never having done something like this sooner in all the months we’ve been doing this (never expect us to do what ought to have been stark staringly obvious long ago!). 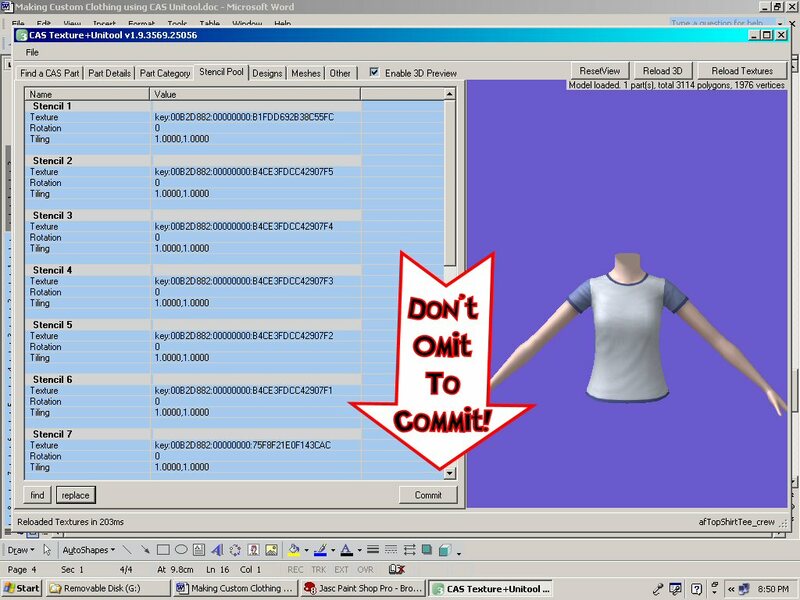 If this tutorial doesn’t, first scream, then ask us or the Simming community as a whole for help, those on Mod The Sims where the Delphy CAS Texture & Unitool resides, or refer to SimInem of SiManiacs probably more legible guide which can be found here (but is a little different to ours in places – just so you know). 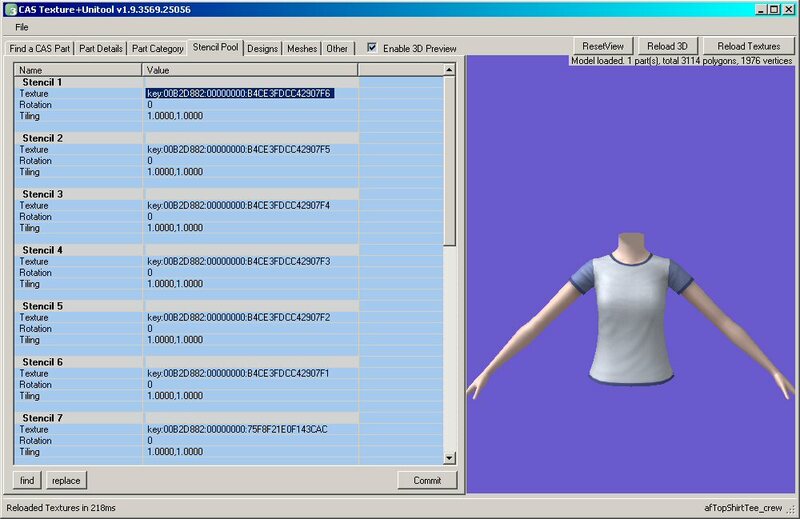 Happy Sims 3 clothes making!